Earlier this week I mentioned the Mr. and I had discovered our new favorite Fall soup recipe. Here it is! We suggest you go put on your jammers and build a blanket fort because this soup is gonna make you toasty warm. 1. Heat olive oil in a large saucepan over medium heat. Saute the celery for 2 minutes. Add potatoes, salt, pepper, and cook, stirring occasionally for 3-5 minutes. Then add green onions, corn, and chicken stock while scraping away any pieces of celery stuck to the bottom of the pot. Bring to a boil, then reduce heat, cover, and let simmer for 12 minutes or until potatoes are almost tender. 2. Add heavy cream and let simmer uncovered for about 3 minutes or until the potatoes are completely soft. Stir in the salmon, shrimp, and lemon zest. Simmer gently until the seafood is cooked through, about 3-4 minutes. Add lemon juice, salt and pepper to taste. Sprinkle dill on top just before serving. Original recipe adapted from Epicurious. Sounds amazing! I love seafood and I love soup. Fall creates the perfect atmosphere for it. I just finished up my own recipe for chicken chili 15 minutes ago! Talk about to die for! I love soup weather! Dinner for next week, I have found you! Thank you for sharing! you had me at the bowl it's in! love it. This sounds divine for a cozy Fall evening. Kayla, I'm with you on the soup weather! When Fall hits, I want to have soup every week! Each part of the process is delightful: the prep to the simmer...from the warm bowl carried to the table...to the warm feelings that the first bite brings...down to the last bite you that you wish wasn't. Ok, maybe I love soup a little too much :-) Hope the recipe brings the kind of Joy that filled the Loerke kitchen! I started following your blog in 2012 when I was studying abroad and your weekly questions came up on my pinterest. I adapted them a little bit for at the time I was dating my now husband. Anyway, we are married now (!!!!) and y'alls blog is still my favorite. Long story short I came across this recipe the other day. The hubs loves chowder...me not so much. We live in Alaska and have an abundance of salmon caught by our own hands so we decided to make this and last night we were singing glory, glory, chowder hallelujah! 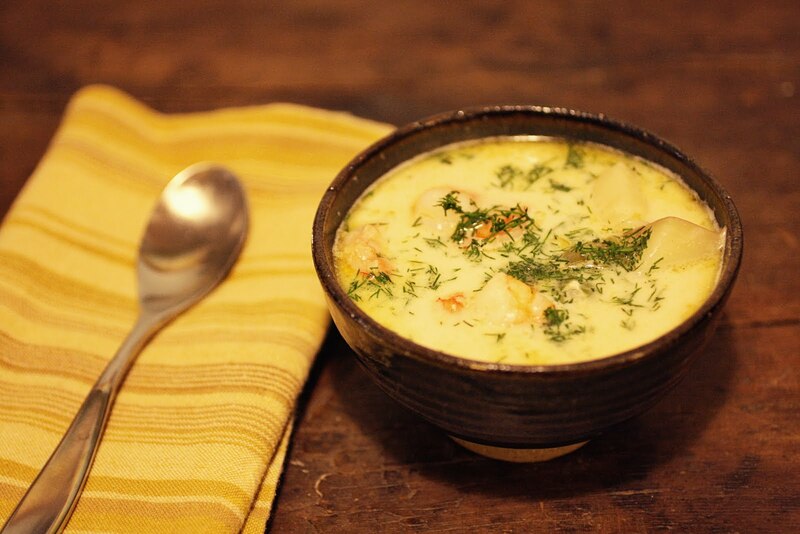 because we now have a chowder recipe we both LOVE. Thank you, thank you from the bottom of my not so loving chowder heart. P.S. we served it with homemade biscuits, sweet potatoes and a kale salad.